Giuliano Stroe was born in Italy in 2004. But by the age of five, living back in his father’s home country of Romania, he was already famous. 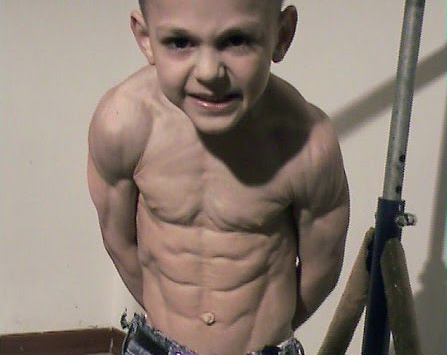 Giuliano had been entered into the Guinness Book of Records as the youngest bodybuilder of all time. He took gymnastics classes starting at two and through a combination of talent, practice, and encouragement from his family, he excelled at an extraordinary pace. But the "encouragement" from the family became something of a problem. After his father posted videos of one of his workouts, Romanian social services started an investigation and ultimately tried to remove Giuliano and his brother from their father’s custody. But his father prevailed after the examining psychiatrist, Dr. Naie Niculina, determined that the children didn’t suffer from mental problems as a result of the extreme physical training. Meanwhile Giuliano has made a career out of breaking records and become known all over the world. His father films him and manages a Youtube channel where you can see Giuliano demonstrate his abilities. While of course we want to wish this little Hulk good luck, it does raise some interesting concerns: is he pursuing his own passion, or his father’s? Is it physically healthy for a small child to do what he’s done? (Will we know before it’s too late for Giuliano?) And what about children being pushed into the spotlight, having a career instead of a childhood… ? It’s hard to know what’s best for someone else. What do you think?